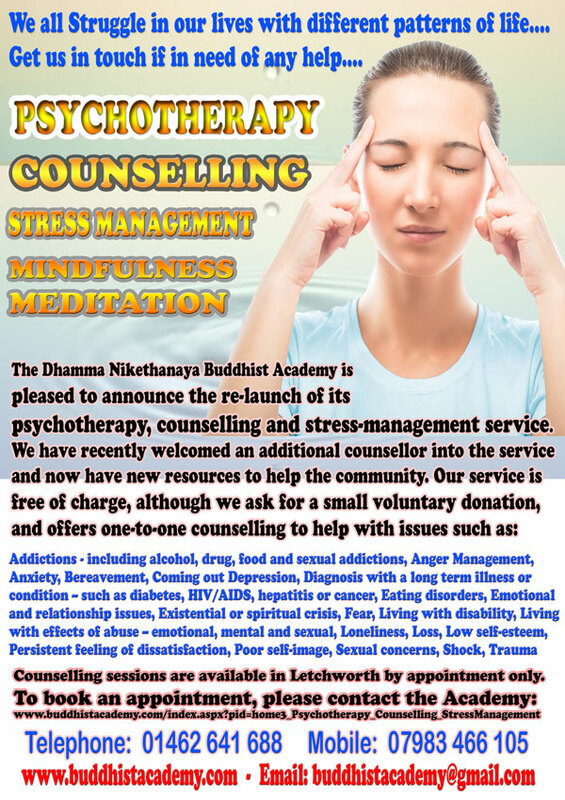 We offer Counselling and Psychotherapy Sessions on One-2-One basis by appointment only. All our sessions are secular and non-religious. No obligation to any faith. All are welcome. Our centre offers above services. Even though we are Buddhists, our services are secular and non-religious. You can benefit from it without any obligation. Sessions are conducted by Bhante Samitha or Mark Brumwell. Bhante Samitha is a senior Buddhist Monk, qualified in traditional monastic practices as well as modern western practices. 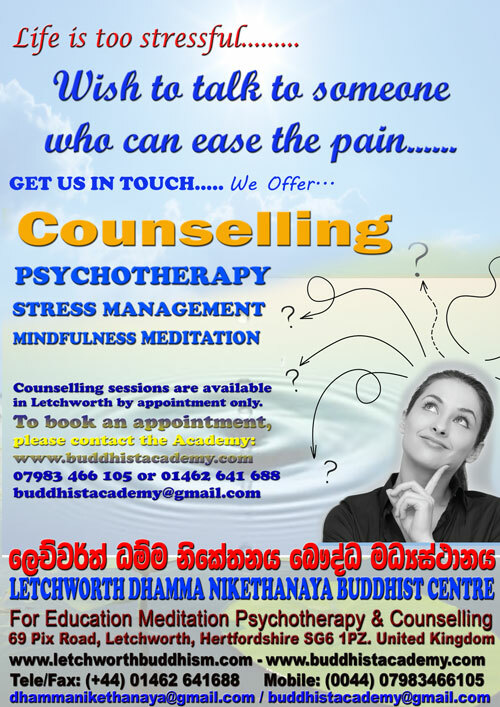 Bhante Samitha is highly experienced and an extremely effective practitioner in Buddhist Counselling and Psychotherapy. Mark Brumwell is a practicing lawyer and experienced Buddhist practitioner, currently training in counselling and psychotherapy with WPF Therapy, formerly the Westminster Pastoral Foundation. His training tradition is in psychodynamic therapy, tailored to the specific needs of the individual. We offer an initial free-of-charge telephone consultation to discuss whether we can help. If we can, futher sessions lasting for one hour are held in the Centre on on a one-to-one basis. Evening appintments are available for the convenience of anyone who is working during the day. Depending on individual needs, it is likely that weekly sessions would be offered for a given period of time. Cost: Normally a donation of £20.00 Per Session of one hour following the initial free-of-charge consultation. Special Note: In principle according to our tradition we don’t charge on our services. We are a charitable organisation working for the community. According to the tradition, all our services are (should be) free of charge. However, as we have no government funding and have no income other than donations, we have to recover the initial cost of running certain courses or services. Therefore we kindly accept donations. For one to one individual sessions (Psychotherapy, Counselling, Stress Management or Mindfulness Meditation) the suggested donation is £10 although larger amounts will be gratefully received if the circumstances of those attending our sessions permits this. Please note, other free support or concessions are available if you have difficult circumstances. Please feel free to speak to us. We are very happy to help our community. Buddhist Psychotherapy describes a range of Buddhist influenced psychotherapy practices that Buddhist Psychiatrists, Psychologists and Psychotherapists have developed out of their meeting with Buddhism and their particular mental health fields. Buddhist Pyschotherapy is a one-to-one form of psychotherapy where privacy, confidentiality and client safety are of paramount importance. It is a contemplative approach to psychotherapy which is greatly influenced by traditional and contemporary Buddhist teachings and understanding of mind. However, it is not a 'religious form' of therapy. 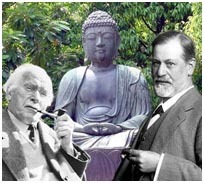 Indeed, it is a balance between cognitive, analytical process informed by Jung, Pavlov, Winnecott, Perls and many others as well as the spiritual teachings and philosophies of the East. It's purpose is to look at how we are now, in the present moment, and how we express past conditioning. By doing this we can consider transforming our relationship to suffering and our inherent feelings of dissatisfaction or emptiness - thus developing a greater and deeper understanding or ourselves and our relationships with others in the present moment of our experience. Buddhist psychotherapy recognises and affirms the 'core' - which is the unconditioned, wakeful self and 'process' - the way we are in the moment, how we respond to our world from both our unconditioned self and the conditioned self is our process. As with many psycho-spiritual forms of psychotherapy, Buddhist psychotherapy looks at our cognitive, energetic and physical being. It provides an opportunity to work on the many levels of our existence, avoiding fixating on particular aspects, but encompassing all. Buddhist psychology is what we call a non-self psychology. According to Buddhist teachings the self is a delusion which we create as a defensive structure to protect ourselves from knowing the realities of life. This Buddhist analysis rests upon an understanding that, as humans, we are bound to experience afflictions (dukkha) of many kinds throughout our lifetimes. These afflictions may be small or large. Our bodies get sick or don't work properly. We get old and die. Our friends leave us or fall out with us. They may die also. Everything is uncertain because nothing is permanent. We can say that we are surrounded by evidence of existential suffering, and that this evidence is unavoidable. We are frightened by it. The way that habit patterns become established is outlined in the teaching of the skandhas. This teaching describes a cyclical process whereby reactions (vedana) lay down the mental formations (samskaras) that in turn create a mentality (vijnana) that leads to the likelihood of future repetitions of the same pattern of reaction. This cyclical repetition is the mechanism of delusion. It is the wheel of samsara. The process that is being described here is the creation of not just one habit but of a collection of reactions that together create a fabric of attachments. This fabric becomes established and rigid. We can say it develops a stickiness (alaya), clinging onto us, or we onto it. Rather as the child's security blanket, it seems to have the power to ward off painful feelings and protect us from knowing our human frailty. The self then creates a psychological barrier between the person and the existential world they inhabit. By creating an illusion of identity, the person creates something that seems permanent and controllable. There is a comfort in the identification with self because it brings with it feelings of inhabiting a knowable universe. Whatever else happens, I know I exist. I think, therefore I am. This self even has a sense of immortality. This feeling may be translated into various belief systems, but whatever conceptual frame it chooses, according to Buddhist teaching, it remains deluded if it feels confident of its own permanence and continuity. Not all experiences of self are comfortable though. Sometimes the self that is created is negative. A poor self image can be just as much a strong sense of self as a positive self image can, and it may be even more tenaciously held onto. This is because the negative self is basically created in just the same way as the positive sense of self. The negative self is a response to dukkha and often an attempt to create something enduring and controllable out of a situation that is unbearable and frightening. This is why people who have experienced great suffering early in life are often plagued by a negative self image later in life. Giving up this negative self, however, can be a lot more frightening because the circumstances of its creation were often a lot more painful than the average person experiences. Such negative self phenomena can be very intractable since the negative self is protective just as much as the positive one. In its creation, the self wraps itself around the senses, stifling and distorting their ability to see clearly (vidya). The common state is a state of non-seeing (avidya). This not only protects us, but also cuts us off from experience. We are no longer seeing things as they are, but are viewing selectively and even distorting our perception according to the need to maintain our identity. The "frame of reference" is the resulting channel of perception, narrowed to fit the personal perspective. This represents part of the self-material. It is a partial view, excluding anything that might threaten the self-concept and over-emphasising elements that support it. Just as the self-image can be distorted in negative as well as positive ways, someone who has experienced a lot of early suffering may also come to view the world in negative ways. Habit patterns of perceiving threat, developed perhaps early in life, support a particular constellation of self-structures, and this in turn creates the likelihood of ongoing negative perceptual distortion. The person sees what they expect to see and expects the world to be hostile. In the Sutra on The Ant Hill, (Majjhima Nikaya 23) the image of a tortoise is used to represent the skandhas, the process by which the self is maintained. This image captures beautifully the nature of the self. Like a hard shell, it protects us, especially if we retreat right inside it. On the other hand, the tortoise's shell is rigid and restricts its movements. It slows the creature down and prevents it doing very much other than lumbering around a rather limited area. Buddhism invites us to throw off the shell that threatens to slow us down and restrict us. It invites us to let go of rigid thinking and perception and become more flexible. At the same time, we are challenged to step out of our habitual identity and face that existential reality that we have been avoiding for so long. We can live more lightly, but we also live more nakedly. A tortoise without its shell might be a lighter creature but it might also feel very vulnerable. For this reason the process of letting go may need to be gradual. The teaching of the Four Noble Truths is a description of the enlightened way of living. It is the path that we follow if we live in good faith with our surroundings. The second stage of this path, samudaya, is a choice point. If at this point, when feeling reactions arise, we distract ourselves by falling into sensory pleasure, self-building, or the final stage of destructiveness, we miss an opportunity. If instead we can face the reality of dukkha, its nobility, we release ourselves and put ourselves on the spiritual path. So what difference does this view of self make to the practice of therapy? How might a Buddhist therapist respond differently to a client? The practice implications of the non-self position are complex. As with any therapy, the underlying paradigm colours a multitude of different responses to individual situations. If one is to generalise though, one important difference can be found in the emphasis placed by a Buddhist approach on encounter. A therapy based on non-self principles is a therapy of encounter with the other. If self is the prison, release comes not through an endless delving into delusion, but rather through the investigation and experiencing of that which is not self. We can say that Buddhist approaches to therapy are other-centred. This might mean exploring the world that the client inhabits in a more questioning way. What is initially presented is generally within the client's frame of reference, and is part of the self-story. Perception is selective and coloured in order to reinforce the self. Getting beyond this frame becomes a route to deeper encounter with the other. The client may be invited to explore the perspectives of significant others in the story. How was it for mother, for father, for the friend? Is it possible to imaginatively step into their shoes? Can one then look more deeply and see that even here, self-patterns have crept in? Unlike most Western approaches where the client is asked "How did you feel about…?" here the Buddhist therapist is interested in "What do you see?" "What might others see? ", and "Can you see it more clearly?" Encounter with life becomes a route to liberation. Whether it is in encouraging focused awareness in everyday tasks, accurate observation of the physical world, giving feeling attention to body sensation or developing empathic understanding of others with whom one works or lives, direct experience can provide a route to reducing self-preoccupation. 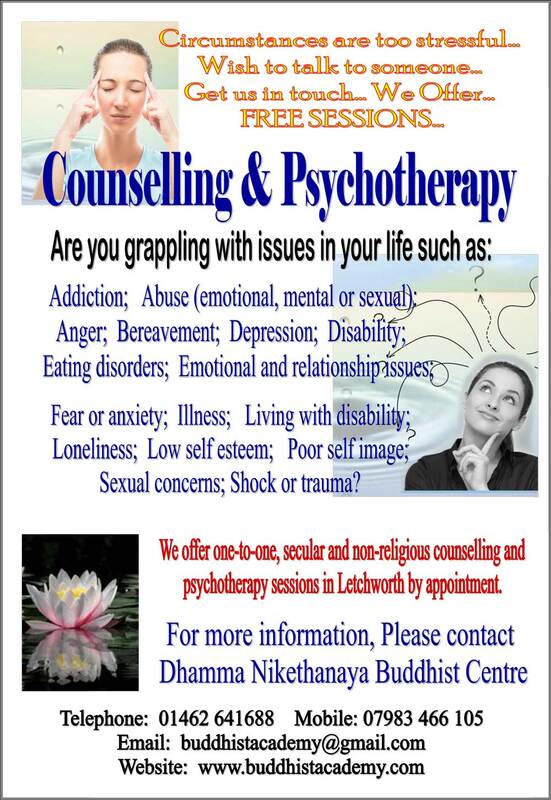 A Buddhist therapist may help the client to engage in any of these. At the same time, introspective enquiry is not completely abandoned. Since thought patterns and habitual views can be understood and recognised for what they are, as therapy progresses, these are explored. What is then discovered is that even these can be released into the realm of that which is other. "This is not me, I am not my thoughts" becomes a spontaneously arising understanding as a person comes to recognise both the fluidity of mental process and its uncontrollable nature. So in this approach to therapy, the client comes to gradually let go of the rigidities of personality that have been thought of as self and moves towards the state of singularity or aloneness which the Buddha described as ekaggata. This state, freed up from the limits of identity, allows for a fuller kind of living. This fluidity of process and engagement with new experiences as they arise is not so different from the ideal states described by some Western theorists, for example Carl Rogers. However, the methods of working that take the client away from self-preoccupation differ both in their focus and in the subliminal messages they convey. An underpinning understanding of the real nature of self and its negative effect allows the therapist and client to work more directly towards a freer, more engaged way of being. Other therapies may eventually sometime reach a point of similar encounter, largely through the congruence of the therapist and the real relationship that arises between therapist and client as two different people. On the other hand, this will inevitably be hindered by repeated reversion to self as the client is constantly reminded to dwell on his own feelings and storyline. Buddhist therapy offers a route to freedom and a route out of the shell that self attachment creates. JACK KORNFIELD was trained as a Buddhist monk in Thailand, Burma, and India. After majoring in Asian Studies at Dartmouth, in 1967 he went to Thailand with the Peace Corps looking for a Buddhist teacher. Upon his return, he earned a doctorate in clinical psychology. In 1975 he co-founded the Insight Meditation Society, based in Barre, Massachusetts, which widely influenced the practice of Vipassana meditation in North America. In 1986 he became a founding teacher of Spirit Rock Meditation Center in Woodacre, California. Today he lives nearby with his family and is devoted exclusively to teaching. His books include Seeking the Heart of Wisdom, A Path with Heart, and Teachings of the Buddha. After the Ecstasy, the Laundry will be released by Bantam Books in June. This interview was conducted at Spirit Rock by HELEN TWORKOV. Jack, while traditional texts expound the path toward enlightenment, in your new book, After the Ecstasy, the Laundry, you explore what happens after the first experience of enlightenment. Is this born of a particularly Western need to bring together dharma and psychology? I don't think there is dharma practice on the one hand and psychology on the other. I believe that sets up a false dichotomy. My teacher Ajahn Chah used to say, “There is suffering, there is the cause of suffering, and as the Buddha teaches in the Four Noble Truths, there is the end of suffering. Wherever you are, that is the place of practice.” Sometimes suffering comes through clinging to certain emotional pain or certain stories; sometimes through not recognizing emptiness, the evanescence of life, that nothing can be claimed as I or mine. The point of dharma practice is to pay attention to where there is suffering, see the clinging and identification, and release it to find a freedom of heart. Yet in so much of traditional Buddhism, paying attention to emotional pain and to the personal story behind it, is seen as something “other than” spiritual activity. How would you describe your initial training in Asia? Was it along those “archetypal” lines? I feel tremendously grateful for the training I had in the retreat centres and forest monasteries, and the kind of initiation that it offered. I was able to enter into that ancient world of the Elders that has been carried on for 2,500 years, the austere practices and surrender they require. When I first arrived in the forest monastery of Ajahn Chah, he looked at me and said, “I hope you're not afraid to suffer.” I said, “What do you mean, afraid to suffer?” And he said, “There are two kinds of suffering: the suffering that you run away from, which follows you everywhere, and the suffering that you are willing to turn and face and thereby find the liberation that the Buddha taught for us all.” That was his opening sentence. Well, he said it with great humour. He wasn't heavy-handed. He would direct people into difficulties without subtly increasing their unworthiness or their self-hatred. He knew how to mentor people, he would look at students and say, “I know you can do this.” He would see what Thomas Merton called “their secret beauty,” their Buddha-nature, and foster that, which is what a great teacher can do. Why did you leave your life as a forest monastic? After my first five years in Asia, I was still quite young, I realized that I didn't want to spend my life as a celibate monk. Marriage, relationships, and living in the world were still important to me, and so I told my teacher that I wanted to return. I felt like I had learned enough of the practices of mindfulness and compassion and now I wanted to see if I could really live them in ordinary life and not in the protected circumstances of the monastery. I didn't feel that I wanted to live as an expatriate in Asia for the rest of my life. I was drawn back to my own culture. The fantastic detachment and great bliss and joy and peace that I had known for some years crumbled. I discovered to my horror that a lot of the neurotic patterns of my life were waiting back here, like old comfortable clothes-fighting with my girlfriend, worrying about money. So I really had to ask myself, “OK, now, how do you actually live this practice, how do you integrate it?” That became the compelling question. And what I found is that I had done a bit of a spiritual end run or spiritual bypass around a number of very painful areas of my life. All this unfinished business returned. I had spent eight or ten years in dharma study and practice beginning in college, working primarily with my mind, through concentration and great ardour, but now there arose all this emotional work. I had to really learn how to bring the principles of mindfulness and compassion into the pain and neurosis in my life. And to transform them in some way. I did that in meditation, through a great deal of emphasis on loving-kindness and compassion. I also did it in psychotherapy, especially body and breath-oriented forms of psychotherapy. And I did it through gradually learning how to be more conscious in close relationships, which was a big practice, and not one that was focused on much in the monasteries. How has this affected your own evolution as a teacher? Probably the greatest change is a shift from the sense of struggle against one's self, what in Asia was the warrior-fighting a battle mode of practice such as I found in the ascetic forest monastery, to a mode that is based on the fundamental ground of compassion and healing. And that happened because in the early years of leading retreats in this country we, as teachers, encountered an astonishing amount of self-hatred and self-judgment in students. We saw that practitioners were taking the dharma language of purification, of ridding oneself of greed, hatred, and delusion and using it to judge themselves, to reinforce unworthiness, or to create spiritual ambition, “spiritual materialism,” as Chogyam Trungpa said. They were trying, in some ways, to negate who they were, which only created further suffering and tension for themselves. It became increasingly clear that the battlefield-warrior archetype did not serve those people for whom the wounds of self-hatred and self-judgment were the primary sources of suffering. And so the form of practice has shifted from a struggle against the self, to letting go, learning to rest on a ground of loving-kindness and compassion for oneself and others. Without the demanding initiation of the ascetic or the warrior, can the path inspire the same levels of motivation and commitment? True dharma practice is a revolutionary activity, and you can't do it in a comfortable way. You really have to challenge the whole identity of your life. But the strength that's asked for is not necessarily the strength of eliminating the impurities of body and mind, or fighting against the defilements of greed, hatred, and delusion, the inner corruptions, though this language is very common in Theravadin, Tibetan, and Zen Buddhism. The strength that's needed is the courage of heart to remain undefended and open, a willingness to touch the ten-thousand joys and the ten-thousand sorrows from our compassion, the deepest place of our being. This is a different kind of fearlessness, which requires as much or more passion and fire. Aren't Western students prone to seek a kind of comfort that can undermine the revolutionary quality that you speak of? Yes. One of the dangers of dharma success is comfort. As the teaching becomes more main-stream it has become more comfortable. Practitioners have become more affluent, and if you combine that with greater emphasis on compassion and less ascetic warrior practice, there's a danger that the true depth of commitment that's necessary for this revolutionary transformation will get lost. Is there a way to counter that? Well, complacency is always countered by integrity, which is an unswerving love of the truth and a willingness to live it. If the teachers don't forget this legacy from the Buddha, then that place in their students that “knows the truth” will reawaken too. They will recognize that liberation is our birthright, our own true nature. One concern shared by many American teachers is that while their own Asian teachers pushed their buttons as a deliberate teaching mode in ways that made them feel very uncomfortable, that if they then do that with their American students, those students are out the door. Conditions for teacher-student relations are different here. If Western teachers treated their students with the deliberately harsh and punishing way Marpa trained Milarepa in the famous Tibetan story, they would probably just plug into the American neurosis of self-hatred and judgment, and the students would flee or file a lawsuit. However, that need for a radical transformation in the student can still happen by focusing on the forms of practice even more than focusing on the teacher-student relationship. The demanding nature of Zen sessions or 100,000 Tibetan prostrations or a three-month silent Vipassana retreat serves to challenge practitioners very well. When people come to me during a two or three months retreat, weeping or frightened or facing whatever demons have come for them, I can be very demanding in telling them, “Now you can discover in this place that freedom is possible for you, or you can run away and be a coward. It's time. I don't care if you die. We'll have your funeral tomorrow. You can tell me if you want to be cremated or buried, but you go back in there and sit and face those demons.” Using the forms of Buddhist practice skilfully, we don't increase our suffering but, rather, the forms empower us and bring a kind of freedom. Because they are based on the truth that all our demons are empty, these forms can work to help us let go, to step beyond our small sense of self-to discover our inherent freedom. And your students don't engage you in their personal stories? Sometimes the story needs to be told in the presence of another person in order to accept it or let go of it. But usually a little bit of the story is enough; we don't need to go back into our whole history. Someone might say that they are suffering because of the past, and we might spend a little bit of time asking, well, what are the beliefs that you have, what are the fears, the memories, the images that you carry? But always working with an underlying awareness which asks: Is that who you really are? Not to solve it or go back and rework it. True inner work is to experience the reality of contraction or fear, just now, and then to discover that it's not our true nature, not who you are. Knowing the story doesn't solve it. What brings freedom is turning to face the root of that suffering, and the identity that's constructed around it, going right into the centre of it until one comes to its true emptiness. And wise psychotherapy must also do that in the same way that dharma practice does, because that's how liberation happens. The therapist wouldn't put more emphasis on deconstructing the story line or on evoking description to release suffering? Not necessarily. Let me give you an example. A woman practitioner came to me in great grief because her husband had recently left her. They had a four-year-old child, and the woman had imagined this beautiful, loving marriage, and it broke up. Her grief was exacerbated by the fact that when she was three years old, her own father had walked out and never returned. When he abandoned her she had come to the conclusions, somewhere deep inside, that men were untrustworthy and that she wasn't lovable. So we worked first with awareness to hold her grief with compassion, not to get rid of it, but to take the meditative seat and accept her situation with mindfulness and compassion. She grieved and wept and there was some necessary storytelling. After a fair amount of work, it seemed time to go back to the core of this primary suffering that she carried. So I asked her to close her eyes, and through visualization meditation she went back to being three years old standing at the top of the stairs, looking down, as a little girl, and her father had his suitcase in his hand and was about to walk out of the door and never see her again. Immediately, she felt grief and terror, this was horrible for her, and I had her tell me what it felt like in her three-year-old body and hold all of that within a spacious attention and compassion. Then I said, “See if you can shift your consciousness and enter your father's body. Tell me what it feels like.” So she did. There she was. She said, “It's rigid, I'm filled with pain and suffering and anger. But more than anything, I feel desperate.” I said, “Why are you leaving?” She went on, “I'm trapped. I'm in a terrible marriage where I'm losing my life, I'm going to die. I want to have a life and I feel like the marriage is so difficult and if I'm here another day I'm just going to die. I have to get out of here in order to survive.” She could feel the rigidity and the desperation. And I said, “Do you know that your daughter is there at the top of the stairs, watching you?” “Yes, I do.” “Well, why do you want to leave her? Why don't you say anything?” “Because if I even look at her for a moment, I love her so dearly, I would not be able to walk out that door. But I can't stay. I'll die. I made the wrong marriage. It's horrible. So I have to keep my eyes down, and grit my teeth, and walk out that door to survive.” She just sat there for a moment, stunned, and I said, “All right. Now go back and be that little girl again, looking.” She sees him leave. What is the story that she tells herself? She said, “He's leaving because he doesn't love me. And because my father doesn't love me, I can't be loved. There's something wrong with me.” I asked her, “Who made up that story?” Somewhat astonished she answered, “I did.” Well, I said, “Is that really who you are?” Ahhhh. In this moment came a whole realization of emptiness—that's not who I am. Next I had her go become her mother, filled with anger and fear, chopping carrots in the kitchen as her husband walks off. As she felt the rage that her mother carried and the anxiety that was in her mother, it made her much more sympathetic to her mother's experience. Finally, she went back to being a little girl again. And she said, “Now I can see the suffering that was there, which as a child I was asked to bear and didn't understand.” I asked, “Can you see how you created a sense of self from that suffering that is not who you really are?” And from that moment, things began to change in her. She had seen her life from the wisdom Ajahn Chah called “The one who knows.” I didn't give her teachings about emptiness and selflessness, or have her do a special Buddhist meditation. But when the inner work is grounded in an understanding of emptiness, then we shift from the “body of fear” to inherent freedom. It's quite natural. When I'm working with people, the ground is emptiness. I'll say to them, “Who are you, and what is the possibility in your life of really being free?” Not in just changing the plot of the story, but letting go of all that we cling to as a false self. In this way, the best of modern psychotherapy can be a kind of paired meditation, which is informed from a spiritual point of view. Once you apply fundamental Buddhist principles such as emptiness and “no-self” to something as socially acceptable as psychotherapy, what happens to the “radical” nature of dharma? To practice the dharma is to swim upstream against the social current. Even in Asia there is a certain truth to that. It demands that we shift our primary values from our attachment to security, from greed for money or worldly success, to value the transformation of the heart. Every day, people come into Buddhist retreat centres carrying an enormous amount of tension, worry, and complexity from living in modern consumer society, and they say, “Help me. Help. Help. How can dharma practice help?” Part of the answer is that they actually have to change their lives! Dharma teaching doesn't just say transform the vision by which you see the world, although that is one aspect of liberation. It also requires you to let go and change your behaviour, change the way you live. The Buddha didn't choose to live in the marketplace of Benares. He lived simply, in the forest. Yet even for his lay followers who stayed in the city, the Buddha emphasized that to free the heart you must act ethically and generously, this is the ground from which dharma practice grows. You can't meditate after a day of killing and stealing. It just doesn't work. On another level, if you live a life that is filled with stressful complexity and are seeking peace and harmony, you will certainly have to change your inner spirit but you may actually have to change the way you live. Freedom is fulfilled by seeing the truth and then learning to embody it in every part of our life. This is not just empty words. I remember going to a psychology conference many years ago and giving a lecture about how I teach ethics to my clients. In traditional psychotherapy, that was a radical thing to do. As a psychotherapist you were supposed to be nonjudgmental. If someone tells you that they're having a string of affairs, you're not supposed to be judgmental about it. But I said, this is ridiculous. If someone comes in and they're having one affair after another or taking money from the till, though I'll listen in a sympathetic way, and seek to help them understand the pain that is driving them, I'll also remind them there are universal spiritual teachings, Buddhist, Muslim, Christian, which say that if you steal or if you kill or if you lie, then inevitably you will create patterns of suffering. You are doing the things that create suffering. I would not tell you what you should do, but I want you to wake up to the laws of life so that you can wisely guide yourself. Certain people's eyes got wide. “You mean you teach this?” I said, “Of course. Aren't we supposed to be helping these people?” Those boundaries between spiritual truth and conventional life seem, in a certain way, quite artificial. In the teaching that I do, what interests me most centrally of all is the possibility of liberation, what is translated in one of our texts as “the sure heart's release.” That is to say it's possible to be free and that freedom isn't found in transcending the world or leaving the world, but here and now, in this very moment. What my own teachers demonstrated so beautifully was that even in the midst of the worst circumstances in Thailand, or Cambodia, or Burma, their hearts were free and open and their compassion seemed boundless. And in the West, part of the appeal is the integration of psychology and dharma? I'm not sure that we need an integration of psychology and dharma. I simply feel that in order to be skilful at this time, the dharma has to include attention to personal life and attention to the kind of emotional deficiencies that are common in our society. It has to bring skilful means of awareness and compassion to those areas, which aren't—weren't—major focuses in the monasteries of Asia. That's all. Of course, in the same way, we must include in our dharma attention the ecological devastation, the continuing racism, and the injustices perpetrated by our materialistic culture; but that's another conversation. The good news is that always in the here and now is the Buddha's invitation to liberation. Whatever circumstances one is in. Anyone can see that if grasping and aversion were with us all day and night without ceasing, who could ever stand them? Under that condition, living things would either die or become insane. Instead, we survive because there are natural periods of coolness, of wholeness, and ease. In fact, they last longer than the fires of our grasping and fear. It is this that sustains us. We have periods of rest making us refreshed, alive, well. Why don't we feel thankful for this everyday Nirvana? We already know how to let go; we do it every night when we go to sleep, and that letting go, like a good night's sleep, is delicious. Opening in this way, we can live in the reality of our wholeness. A little letting go brings us a little peace, a greater letting go brings us a greater peace. Entering the gateless gate, we begin to treasure the moments of wholeness. We begin to trust the natural rhythm of the world, just as we trust our own sleep and how our own breath breathes itself. It is I who must love myself. No one else can make me feel whole. Only I can provide that love. Now I know that wholeness is always accessible to me and all beings everywhere. This knowing allows me to live with a new peacefulness and kindness to myself and others. In the simplest way, it has changed my whole life. Again, the lesson of spiritual practice is not about gaining knowledge, but about how we love. Are we able to love what is given to us, to love in the midst of all things, to love ourselves and others? Are we able to see the illumination offered by the sun every morning? If we cannot, what must we do in the body, heart, and mind to allow us to open ourselves, to let go, to rest in our natural perfection? The gate is open, what we seek is just in front of us. It is so today and every day. Knowing how the mind works in Buddhist meditation allows one to make appropriate choices regarding emotional management and peak performance in daily life. How the mind works in Buddhist meditation is the key to its success in generating a state of happiness or well-being. According to writer Katherine Ellison, Western science is seriously remiss in believing that "each of us has a more or less genetically determined set point for well-being - and that happiness or love happen to us" (p.73). Buddhist meditators, however, see meditation as a tool to retrain one's mind, relinquish negative thought patterns and sustain a coherent and benevolent worldview. Neuroscientists agree that something happens to the mind during the practice of meditation that literally retrains the cognitive circuits for better stability and performance. Researchers have found that emotions are registered as brain activity. How the mind works during emotional states can be seen in the level of activity in the prefrontal cortex. EEG scans reveal that during meditation, theta waves are most abundant in the frontal and middle parts of the brain. Theta waves have been associated with enhanced creativity and deep relaxation. A higher level of brain activity in the left prefrontal cortex is associated with happiness and enthusiasm; negative emotions such as anxiety and depression are associated with increased activity in the right prefrontal cortex. According to neuroscientist Richard Davidson, most people have a standard "baseline ratio of left to right activation" (Warren, p.303). Someone with an extreme rightward lean is more likely to experience clinical depression; people with a leftward lean are more fortunate: they are generally happier and more enthusiastic. However, these standard profiles are not absolutes. Because the brain is neuroplastic, its profiles can be changed with the practice of Buddhist meditation. Davidson discovered that a comparison of before and after brain scans of meditators showed that there was a significantly greater activation of the left prefrontal cortex within months of meditation training. This explains the nature of healing meditations - why meditators generally report a drop in levels of stress and anxiety. One of the trademarks of long-term Buddhist meditators is the development of a sense of compassion or loving-kindness. How the mind works during compassion can be seen in the increased gamma activity in the brain. Davidson claims that long-term meditators produce significantly higher gamma activity across much of the cortex, particularly when they meditated on compassion. What are gamma brainwaves? These are brainwaves oscillating between 38Hz and 70Hz that are associated with optimal brain function. Their presence is correlated with decreased negative emotions, higher intelligence, better memories and an increased desire to open up oneself to the world. These waves are also responsible for synchronized communication among different parts of the brain. In normal people, gamma brainwaves occur only in short bursts during REM sleep. In experienced meditators, gamma brainwaves are produced in a sustained manner that is highly unusual. Using magnetic resonance imaging, neuroscientist Sara Lazar has found that meditation increases the thickness in areas of the brain associated with the processing of sensory input and attention. This is the gray outer layer of the cortex where cortical cell bodies are situated. An increase in gray matter thickness indicates an increase in the number of neurons, dendrites and glial cells, recently discovered to be agents that enhance how the mind works during creative thinking. Moreover, Lazar found that cortical thickness is more pronounced in older people. In fact, the cortical thickness of 40-50 year old meditators was similar to the average thickness of 20-30 year olds, suggesting that meditation has pronounced anti-aging effects, slowing the neural degeneration of certain parts of the brain. Knowing how the mind works in Buddhist meditation allows one to make the appropriate choices regarding emotional management and peak performance in daily life. Knowing that one has the tool to defeat negative thought patterns, increase cognitive performance and enhance empathy and compassion is in itself liberating.